Flock of albatross birds on New Zealand's Taiaroa Head. 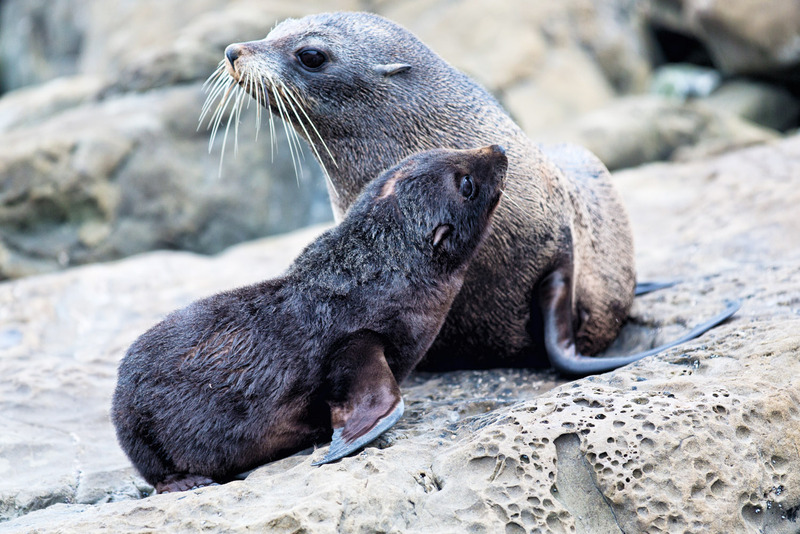 Among the wildlife that inhabits New Zealand's southern zoo, Taiaroa Head, is New Zealand fur seals. On the southernmost tip of New Zealand is a zoo like no other in the world. IT reader Jane Jeffries gets up close and personal with its inhabitants. Off the southern coast of New Zealand at Taiaroa Head, an albatross soars overhead. It’s cold and bleak on the ocean. I haven’t seen an albatross before but then I haven’t visited this extreme southern zoo before. I’ve come hoping to see one albatross but I’ve already seen 20. Maybe I’m doubling up, but I feel like the sky is full of them. With my feet abreast, I brace myself against the elements as the M.V. Monarch surges with the swell. The wind blows a strand of hair into my eye. I wipe it away as I turn my head to see birds gliding directly above. They are mostly juveniles but their wingspans are still up to three metres. 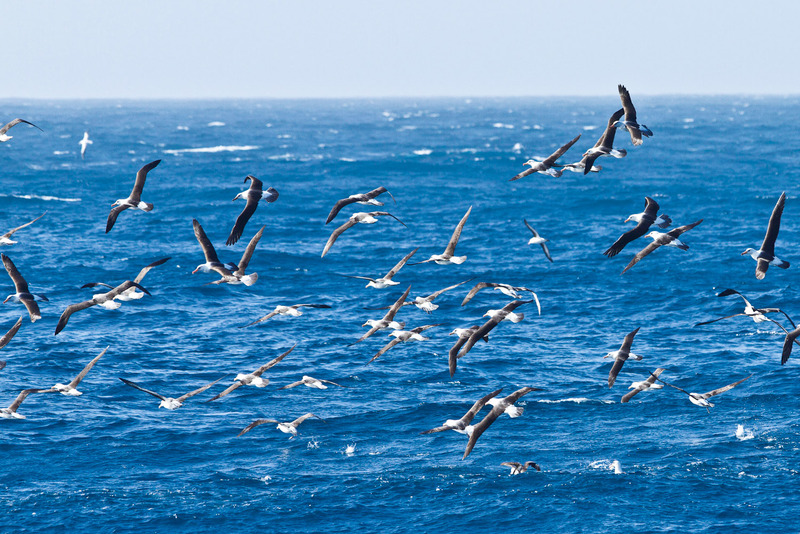 Finely tuned and aerodynamic, when albatrosses fly there’s no sound; as their wings lock, their gracious soar is silent. The skipper, Ed Ansell, tells me these adolescent birds are coming back to the colony for the first time since leaving their nests to court and eventually find a life partner. They have been at sea for five years without touching land and will spend over 90 per cent of their life on or over the water. While the young preen and practise their synchronised flying to impress other young guns, the more mature birds are also returning to the colony to meet up with their significant others and mate again. During a female’s fertile years she produces a chick every second year. When their fledgling leaves the nest, both adult birds return to the sea alone. Months later they arrive back to the colony, often within days of each other, to mate and raise another chick. While the presence of these large sea birds dominates Taiaroa Head during mating season they are by no means the only inhabitants. Our skipper manoeuvres the boat close to the rocky shore. Three New Zealand fur seals, easily recognisable by their tiny ears, are sitting on a rock ledge as kelp swirls beneath them. Sucked in by the tide and forced back out again, the dancing kelp produces sea mist to keep the seals moist. A younger male attempts to climb the rocky shelf to join a harem of females above, but is quickly nudged back into the ocean by a mature bull protecting his territory. It’s breeding season for the fur seals too and soon these females will give birth to their pups. Wasting no time, the bull will mate with the females almost immediately, but delayed implantation means the pup will only be born 12 months later, after a gestation period of nine months. Next the skipper takes us north-west off Wellers Rock until we are under a vertical cliff. Covered in unusual nests, Ansell explains that the cliff face is home to the Stewart Island shag, also known as the bronze shag. These chunky, unattractive birds with their high-pitched squawk come and go from their chimney pot-shaped nests made out of organic material and guano. Anchored to the rock, the birds face the prevailing wind for an easy take-off. While so many of the Southern Ocean inhabitants are best seen from the water, the world’s smallest penguin, the blue penguin, is an exception. Around dusk each evening the penguins can be seen returning from a day feeding at sea. As the light fades we wait on a viewing platform while our guide explains how the penguins congregate into small groups called ‘rafts’ before coming ashore. As soon as he finishes explaining this we see ripples on the water and hear the penguins’ shallow squeal. After a short swim, a wave finally washes them ashore and they fumble to standing, shaking themselves dry. Exhausted, they shuffle up the beach to their burrows to feed their complaining young. Not far up the hill from the penguins’ nests is the Royal Albatross Centre, a wildlife reserve where albatross chicks can be seen waiting for food as their parents fly in. Large, white and fluffy, the chicks will be nurtured by their parents until they leave the nest at nine months old. This Southern Ocean zoo is prospering. 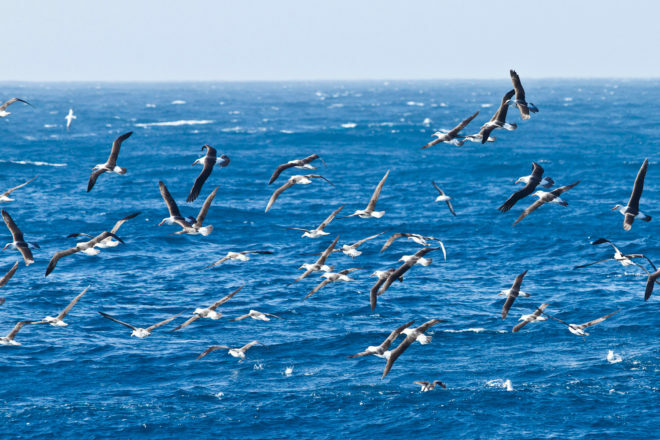 From just three breeding pairs of albatross in the 1930s, the world’s only mainland colony has grown to over 140 breeding birds, the seal population is flourishing, sea lions are breeding and the bird life is prolific. It may not be a typical zoo, but to see these creatures in their natural habitat is the most exhilarating zoo experience I have ever had.